*Disclosure: Article provided by AutoMD.com, no compensation was received. Now that teens are back at school and settling into their studies, it’s also a good time to tutor them on important tips for staying safe, both on and off the road if their car breaks down. According to the National Highway Traffic Safety Administration, traffic accidents are the number one killer for teens aged 15-to 20-years old in the United States (1). And according to parents, a majority of teen drivers(2) are relatively ‘clueless’ about general auto repair and vehicle maintenance. Proper vehicle maintenance is key to vehicle safety. Because teen drivers have limited experience on the road, they may also be unaware of what to do and how to stay safe if their vehicle breaks down. The AutoMD.com Teen Auto Repair and Maintenance Guide not only includes important tips on vehicle repair and maintenance, but also offers advice on what to do in the event of a break down. 1. Get your car off the road – If your car stops running properly, and if you can, move your vehicle to the right-hand side of the roadway as soon as possible. Avoid stopping your car in an active traffic lane. Once you have moved your car safely to the side of the road, apply your parking brake and turn your steering wheel in the opposite direction of the road so your vehicle doesn’t accidentally roll into traffic. 2. Call for help – Make sure to have a working cell phone in your possession at all times, in case of an emergency. 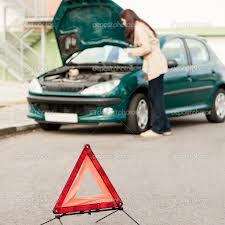 Have emergency assistance / roadside assistance numbers handy if your insurance provides it, or if you belong to AAA. AutoMD Mobile also offers auto repair info on-the-go, giving stranded drivers clues to diagnose their problem, and helps them find a local repair shop. And, like every good boy or girl scout, always be prepared – carry items such as flashlights, flares or hazard triangles, a first aid kit and blankets in your car – in case of a roadside breakdown. 3. Alert others with lights and signals – Remember to immediately turn on your emergency flashers to signal a problem. Once stopped, if it is safe to exit the vehicle, use flares or hazard triangles to alert other motorists of a problem and place the flare or triangle approximately 50 feet behind your car to give other motorists adequate notice. Also, raise your car hood or tie a white cloth to your door handle as a signal for police help or assistance from passersby. 4. Stay in your car unless it is absolutely unsafe to do so – It is best to stay in your car while waiting for help to arrive if your car is safely out of traffic. Stay inside the vehicle with your doors locked and your seatbelt fastened. Getting out of your car, even when parked along the roadside makes you a pedestrian and the roadway is no place for a pedestrian. According to a government report(3), 4,000 pedestrians are struck and killed each year, and about 700 of those pedestrians are people working in the roadway. Exercise caution when accepting help from strangers. If you are suspicious, don’t open your door. Instead, lower your window enough to talk and let them know help is on the way, or to ask them to make a phone call for you. If you absolutely must exit the car, use the door on the opposite side of the roadway, remember to NEVER step into the road, and always look out for traffic and moving cars around you. 5. Tire trouble – If you have a flat tire or a tire blowout, pull onto a flat area if possible so that a car jack can be used safely and properly. If you have never changed a flat tire, do not attempt to try it for the first time when you are pulled over on the side of the road. AutoMD.com’s Teen Driver Car Maintenance and Repair Guide offers step-by-step instruction on how to change a flat tire, as well as other basic vehicle maintenance and repair instructions. Practice these repairs in advance with a parent or other responsible adult. Also, it is a good idea to carry tools in the event of an emergency, such as a jack, wrenches, screwdrivers, and be sure you have a properly inflated spare tire in your car – you might be surprised to learn that many automakers are not providing a spare tire in new vehicles(3). 4) A list of car maintenance and repair "Tips and Tricks"
To access the AutoMD.com Teen Driver Car Maintenance and Repair Guide, visit: www.automd.com/teen/.